WHERE ARE YOU? 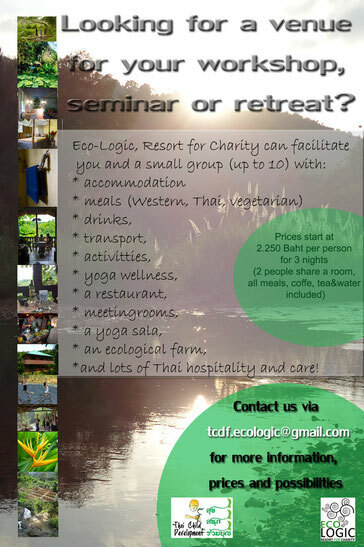 - Eco-Logic Yoga Retreat. A good cause to support. Located in the middle of the jungle. You would probably think: "WHERE IS THIS PLACE? LET'S GO THERE!" Because I just described Eco-Logic, Resort for Charity. And we are looking for people who would like to bring a small group of people (up to 10) to our small Eco-Logic Retreat, for workshops, seminars or wellness retreats. So come with your yoga-, art-, meditation-, photography-, empowerment-, or social- events to Paksong! And help us help the projects of the Thai Child Development Foundation.